The story of William Melville, MI5’s first spymaster, the son of a publican from Sneem in Co Kerry, who emigrated to London in the 1870s and joined the Metropolitan Police. In an extraordinary life of adventure and intrigue Melville rubbed shoulders with Fenian bombers, anarchist assassins, Jack the Ripper, kings, queens, German spies, and Harry Houdini. An exhibition of paintings by Edward Wilson (1892 – 1912). Scientist, naturalist and artist, Edward Wilson was from Cheltenham in England. In 1900 he joined Captain R.F. Scott’s Discovery expedition to Antarctica as the junior medical officer and zoologist. Another member of that expedition was the Kerryman Tom Crean, on the first of his three trips to the frozen continent. 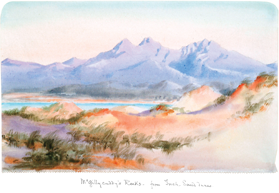 On his return from the Antarctic Wilson and his family came to Kerry on holidays in August 1905, taking a house overlooking Inch Strand, and it was here that he painted a number of landscapes of the area. One of the most successful exhibitions ever staged in KCM it told the story of Tom Crean, the man from Annascaul who went to Antarctica three times in the early 20th century with both Robert Falcon Scott and Sir Ernest Shackleton. The impetus for the exhibition came from a collection of material donated to the Museum by Tom Crean’s family and this was used in conjunction with loans from museums and private lenders in Great Britain, Norway and the United States, to tell the story of an extraordinary man whose achievements went unnoticed in his native country for over seventy years. An exhibition that traced the pattern of settlement in the Lee Valley from the Neolithic period to the present day. In the late 1990s archaeologists identified a wealth of previously unknown sites, uncovered as a result of a number of building developments around the Tralee area. These included a passage tomb, a Neolithic house, hill forts, earthworks, ring-barrows, fulachta fiadh, standing stones, cairns and ceremonial enclosures. A series of interactive displays and workshops, illustrating daily life in pre-historic Ireland. Visitors were given the opportunity to construct a Mesolithic hut/shelter, to make Bronze Age pottery, prepare skins and hides, using real and replica objects. A highly acclaimed exhibition tracing the origins and development of space flight. It was organised in conjunction with NASA and the European Space Agency, and was officially opened by Neil Armstrong, the first man to walk on the moon. Exhibition highlights included moon rock, a re-created lunar landscape, original space suits, scale models of space craft and probes, a video wall presentation, and a computer-based virtual reality space flight programme specially produced for the exhibition. Celebrated 100 years of broadcasting and telecommunications the exhibition featured audio-visual displays, videophone links, digital video, sound archives, and live radio broadcasts. The exhibition traced the origins of the War, the rise of the Third Reich, the Holocaust, and the major battle campaigns in Europe, Africa and the Pacific. It featured a range of military equipment, uniforms, manuscripts, newsreel footage, as well as Allied and Axis forces memorabilia. The exhibition traced the development of medicine from the earliest times to the present day. 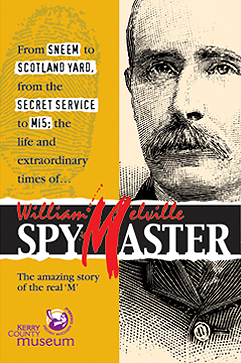 ‘From Sneem to Scotland Yard, from the Secret Service to MI5; the life and extraordinary times of William Melville, Spymaster’. ‘McGillycuddy’s Reeks from Inch sand dunes’. One of the 12 Kerry landscapes by Edward Wilson generously donated to KCM by his family. 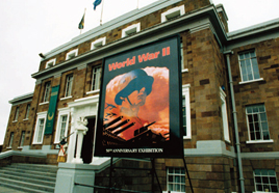 WWII Exhibition promotional display outside KCM in 1995 made a big impact on Denny Street. 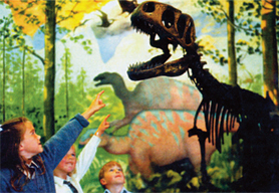 As expected The World of Dinosaurs proved to be a huge hit with kids.